Adopting a dog is a lifetime commitment that can last for 15 years or more - but that's not the case for everyone. 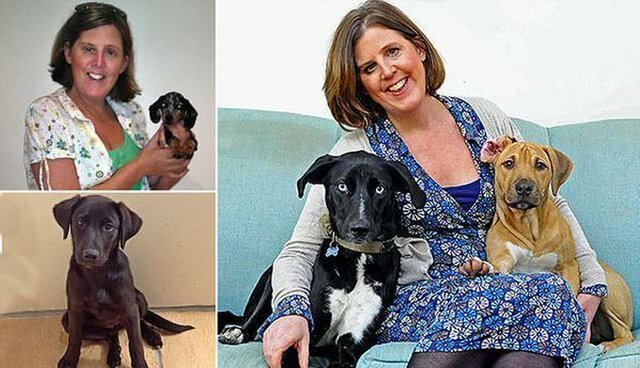 In a truly callous confessional last week, Shona Sibary, a columnist for the U.K.'s Daily Mail, admitted to buying and then giving away four puppies as soon as they were no longer cute and small. With little regret or remorse, Sibary described giving up her family's husky puppy, Juno. "Juno was looking up at me so beseechingly I almost changed my mind. Almost. But as she and her new owners drove away that afternoon in June 2012, with Juno staring accusingly out of the back window, I felt nothing but relief," she wrote. "You see, I already had my eye on another puppy ... "
What's so utterly strange about Sibary's confession is that she's aware that buying and then giving away one puppy after another is a bit of a problem, but she doesn't seem to understand just how cruel it is. "Maybe I'm like this because I was never allowed a puppy as a child. Maybe I just don't know my own limitations when it comes to training an animal and clearing up after it," Sibary wrote. But when it comes down to it, Sibary blames the dogs, not herself. One of her puppies had to go because she was digging up the yard, another was too big and aggressive with other dogs and two more were given away for running wild on nearby farms. Not once in the entire piece does Sibary stop to consider the specific effects that being given away to strangers might have on her pets, or the steps she could have taken to correct the behaviors she found so difficult, although she does pause to wonder what kind of example she's setting for her four children. The reality is that dogs are pack animals who form strong attachments, and leaving the home they've known since they were very little can be scary, even traumatic. "Moving to a brand new home can be very stressful for a dog," according to the ASPCA, which urges dog owners to "thoroughly consider alternatives" before re-homing a pet. But instead of considering alternatives, Sibary admits that giving away her puppies has basically become routine to her. "I have loved, for a while at least, each and every one of my dogs," she wrote. In an even weirder twist, some of Sibary's earlier articles (about lying to a dog rescue group) contradict her story here ... so she's either making up a story about how she got her dogs or how she gave them away. Sibary may be going for shock value; one of her other recent pieces for the Daily Mail admits that she prefers her son to her daughters - though that shouldn't diminish the issue at hand. Sibary issued a halfhearted defense on Twitter after the article was first published last week. "I'm not leaving them on the side of the road guys. They were all found loving homes!" This post has been updated to reflect new information regarding the veracity of Sibary's story.